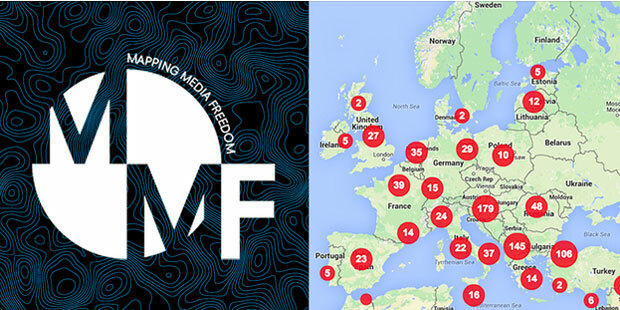 Index on Censorship, the European Federation of Journalists and Reporters Without Borders are delighted to announce the expansion and redesign of Mapping Media Freedom, which records threats to journalists across Europe, and which will now also cover Russia, Ukraine and Belarus. First launched in May 2014, the map documents media freedom violations throughout the European Union and neighbouring countries including the Balkans and Turkey. More than 700 reports were logged on the map in its first year, lifting the lid on the everyday threats to media freedom that have previously gone largely unreported or undocumented. “Mapping Media Freedom has highlighted the kinds of threats faced by media organisations and their staff everyday throughout Europe — from low-level intimidation to threats of violence, imprisonment, and even murder. Having a detailed database of these incidents – most of which previously went unreported — helps us and others to take action against the culprits,” said Index on Censorship CEO Jodie Ginsberg. The relaunched online platform will make it easier for policy makers and activists to identify trends in media freedom and to respond efficiently with immediate assistance or to campaign on specific issues. It also provides support such as legal advice and digital security training to journalists at risk. Anyone can submit their own reports to the site for verification by project officers. “At a time when freedom of information is facing threats not seen since the times of the Soviet Union, supporting journalists and bloggers is crucial. While part of the continent is sinking in an authoritarian drift, online surveillance has become a common challenge”, said RSF Programme Director Lucie Morillon. Following renewed funding from the European Commission earlier this year, the crowd-sourced map incorporates new features including country filters and an improved search facility. The project also aims to forge new alliances among journalists across the continent, especially young media practitioners who will find useful resources and in depth coverage on a dedicated “Free Our Media!” page. In reaction to new draconian measures and violence in the region, the new design coincides with an expansion into Russia, Ukraine and Belarus. All new reports from this area will be available in English and the regional language. “The enlargement of the monitoring process to Ukraine, Russia and Belarus is good news for journalists and media workers in the region. Journalists are usually at the heart of violent demonstrations, clashes and armed conflicts where they may be shot, assaulted, kidnapped, arrested, abused and killed. They are facing difficult professional challenges between extremists or propaganda agents. Thanks to its affiliates, the EFJ will continue to document all media violations and raise awareness to end impunity when violations occur”, said Mogens Blicher Bjerregård, EFJ President. Partners, country correspondents and affiliates to the project — including Human Rights House Ukraine, Media Legal Defence Initiative and European Youth Press — will work together to ensure the growing threats to media freedom in the region are highlighted, and tackled.